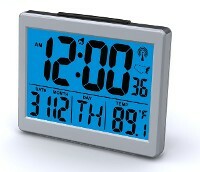 Handsome 2'' time number atomic LCD wall/desk clock with alarm, temperature, humidity, date and day of the week. Automatically sets to correct time from signal from National Time Observatory in Boulder, Colorado. Stand for desk. Two tone (silver and gray) finish. Temperature in Fahrenheit and Centigrade. Snooze button. Uses 2 "AA" batteries (not included). Atomic desk alarm clock with large 1.5'' time numbers. Super bright back light on demand to tell in the dark. Always correct because it picks up time from the National Time Observatory in Boulder, Colorado. Date, day of the week and temperature are .625'' numbers. Metallic color. Uses 2 "AA batteries (not included). 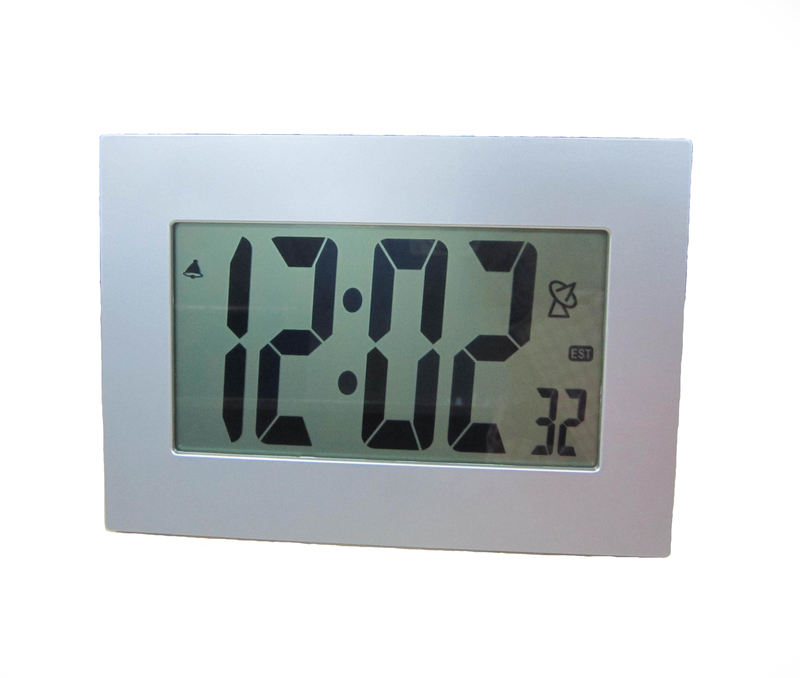 A highly visible 2'' high LCD number clock in a sleek silver colored cabinet. Precision clock displays month, date, day of the week and is an alarm clock, too. Always accurate, sets automatically from governmental signal sent from Boulder, Colorado. Operates on 1 ''AA'' (not included). 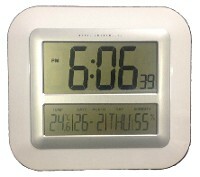 Brand new atomic clock design with 1.75'' white time numbers and .75'' blue date, day of the week and temperature numbers. Sets itself automatically from the National Time Observatory in Boulder, CO. AC Power for continual illumination. 1.0A USB charging port for charging smart phones. Buttons on top for easy setting of alarm and time. Measures 7.25'' wide x 4.625'' high x 1.25'' deep. Can use two ''AA'' batteries (not included) if constant illumination is not necessary. Atomic desk or wall alarm clock with 1.5” time numbers. Blue back light on demand, date, day of the week and temperature. Easy alarm setting with buttons in front of the clock. 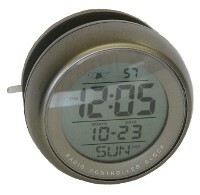 Sets itself automatically from the National Time Observatory in Boulder, CO. Silver and black color. Measures 4.625” wide x 5.25” high x 1” deep. Uses three “AAA” batteries (not included). 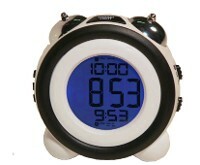 1 1/2” display LCD alarm clock with adjustable volume control for time and temperature announcement. Also shows temperature on display. Bright blue light on demand. Tilted cabinet makes for easier reading. Sensor control talking and light. Snooze. Easy to set. Black color. Measures 5 3/4" wide X 2'' deep'' X 2'' high. Uses 2 ''AA'' batteries (not included). Master Pack Carton: 10" X 12" X 14"
Gift Box Carton: 6" X 2.5" X 3"
Talking LCD alarm clock with bright blue back light. Press button for verbal time and temperature. 1'' time numbers with date and temperature. Uses 2 ''AA'' (batteries not included). 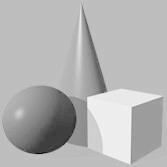 Silver and gray color. 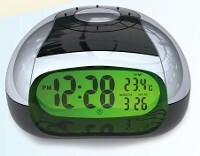 Easily read alarm clock with huge 2.5'' LCD numbers. Bright blue light on demand for viewing at night. Perfect for bedrooms, desk, or counter. Wedge shape stand is built in so clock will not easily tip over nor will stand break off the unit. Uses 2 ''AAA'' bateries (not included). Black cover. 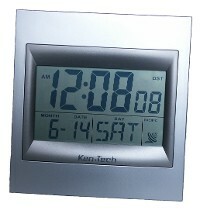 Atomic LCD clock with mechanical bell alarms. ¾'' high number with 2 alarms for weekday and weekend or his and her. Snooze. Bright blue light on demand. Uses 3 ''AAA'' batteries, (not included).Measures 4'' wide X 4'' high X 2¼'' deep. 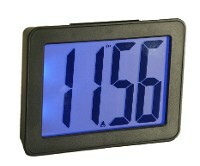 Atomic LCD wall/desk alarm clock with 2.5'' time numbers. Date, day of the week, temperature and humidity reading. Always accurate. Has stand for desk use. Three mounting holes in back so clock will not need straightening on the wall. 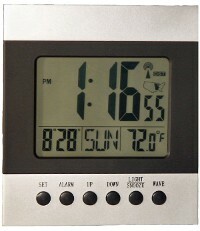 Atomic LCD Alarm Clock with indoor and outdoor temperature and humidity. Bright blue back light on demand. Outside temperature and humidity by wireless remote sensor. Time numbers are 1.25'' high. Display shows day of the week, month and date. Wake up knowing the temperature outside. Perfect for bedroom or desk. 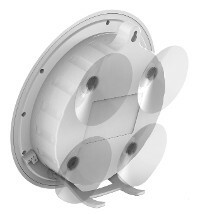 Swivel cover to provide protection to clock or for use as a stand. Clock uses 2 ''AAA'' batteries and remote uses 2 ''AAA'' (not included). When the room becomes dark, the clock automatically lights up to allow easy reading of the time. Operates on batteries, so no need to plug into a wall. Time numbers are 1 1/2'' high. 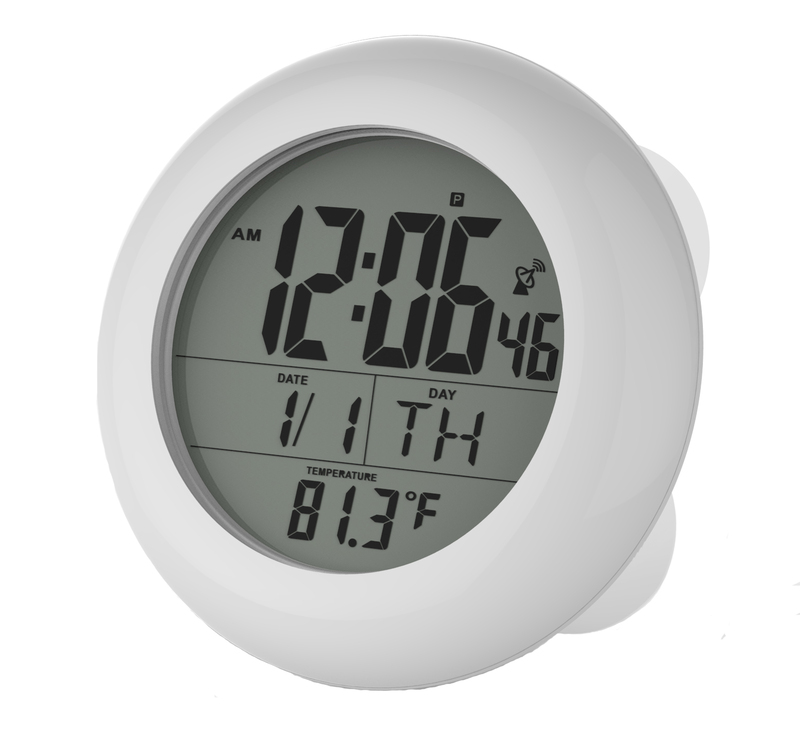 Clock shows alarm time, date and indoor temperature. Snooze and ascending sound alarm. Black color. Light can also be on demand. Measures 5 1/4'' long x 2 3/4'' high x 1 3/4'' deep. Uses 2 ''AAA'' batteries (not included). 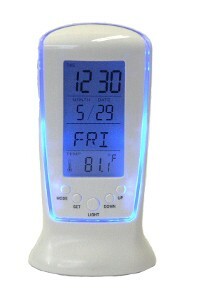 Atomic LCD alarm clock with month, day of the week, and temperature and 3 super bright LED flashlight. 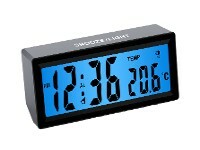 Blue back light (on demand) for LCD clock, 1/2" LCD time display. Uses 3 button batteries for the flashlight (included) and 2 "AAA" batteries for the atomic clock (not included). Carrying strap. Snooze button. 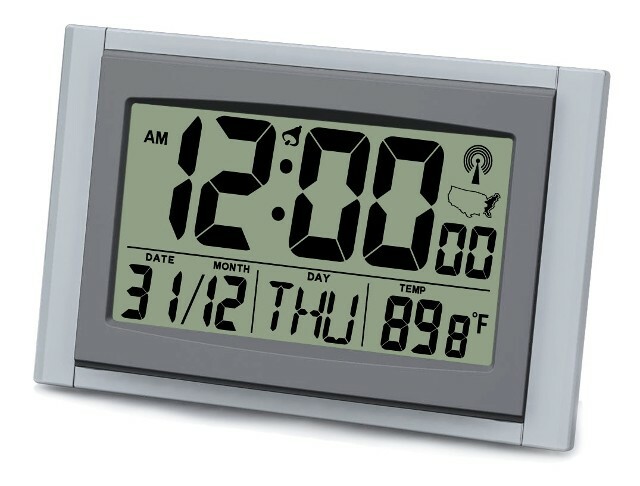 LCD alarm clock with date, day of week, and temperature. On demand blue back light and around the edges for viewing at night. 1/2'' high time numbers. Birthday reminder and timer. Wide base so it will not tip over. Uses 3 "AAA" batteries (not included).